Stephen Williamson: New Monetarist Economics: Where's the Multiplier? 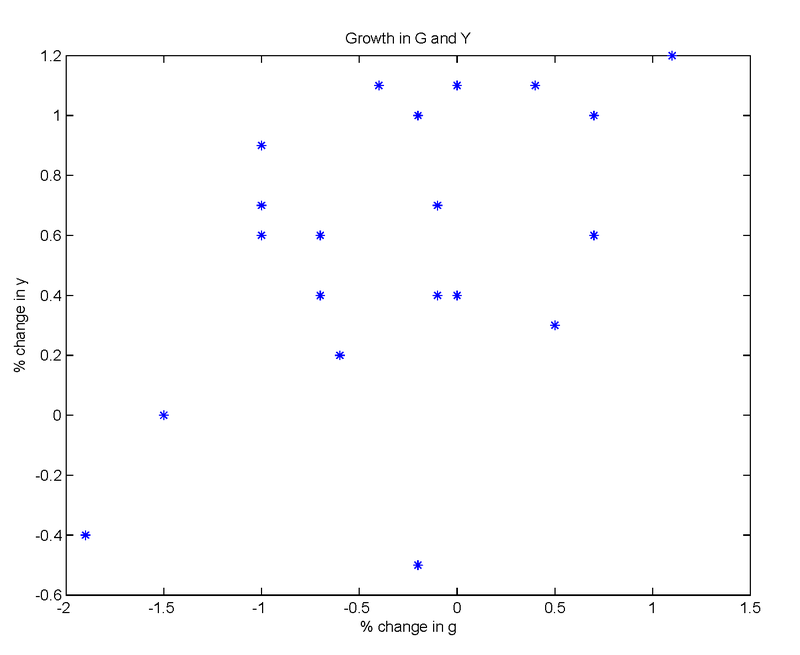 Why don't you use scatter plots from FRED if you are so proud of it? So who is the dim-wit? Stupid cat didn't show me that. 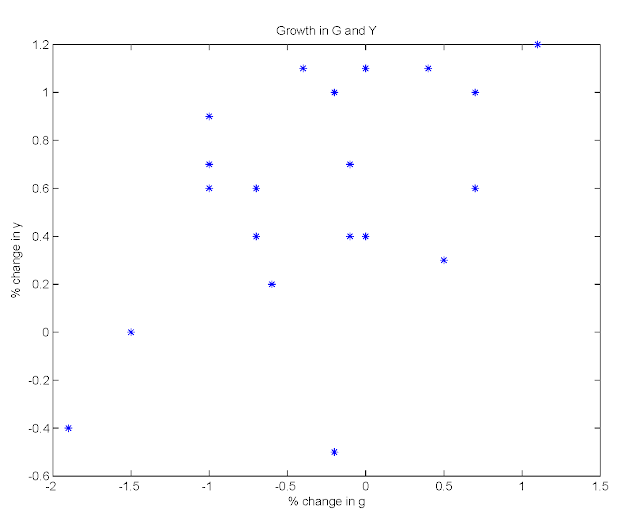 Seriously, though, I have never used FRED to construct a scatter plot, and had no idea the capability was there, though of course it seems natural that it would go beyond time series plots. 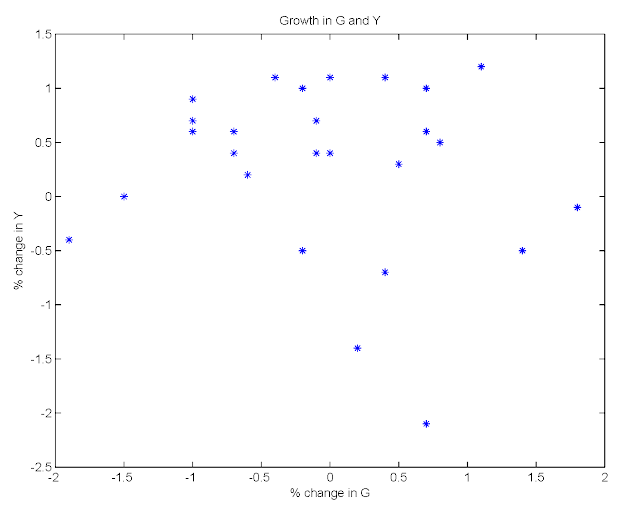 But, I saw that Waldmann had what looked like a FRED scatterplot, so I looked around to see how that might be done, but with no success. If I was at work, I'd just ask Zimmerman, but I wasn't, so I thought, screw that. It takes a few clicks to import the data into Matlab and do it there. By the way, you seem to have an attitude. Not nice to call people dim-wits. 1. As mentioned above, FRED delivers scatter plots. 2. It's Zimmermann, not Zimmerman. Yes, it's a standard, and maybe obvious point. Endogenous policy makes inference difficult. I like to give undergraduate students an example of an active central bank in a sticky price world vs. a price-stabilizing central bank in a world where money is neutral. The time series are identical. It's one of those things that's only obvious when you've seen it. And we seem to keep forgetting it, especially in new contexts. There are, thankfully, rarely clear-cut experiments in economics outside of the lab. But Europe has just conducted an experiment and the result is that Macro 101 is correct, contractionary fiscal policy during a recession in which interest rates are close to zero is indeed contractionary. If you wanna read serious stuff on it, there are some decent IMF papers and they all estimate a multiplier above one. This is hardly surprising, we are in a liquidity trap so fiscal policy is the only game in town. During "ordinary" recessions it is most likely far lower. Of course New Classicals like Williamson are ignorant of Econ 101 (gee, the monetary "model" of this guy is basically just the Fisher relation with the implicit assumption that the real rate is fixed or not impacted by monetary policy which is obvious nonsense) and anti-Keynesian by nature (the usual riggt-wing stuff: not caring about the unemployed, caring about rentiers, dismissing that government could ever do something useful and so on). You've swallowed the Kool-aid apparently. "There could be multiple equilibria. But, when we start to think in terms of normal economics, it becomes clear that the effects of government spending depend on what the government spends on, how the spending is financed, etc. And we start asking more questions - interesting ones." Pity, because we have so much historical investigation (which is not just numbers) to look at, and so much work done by historians and others on the actual long term consequences of large increases in government expenditure, inflation and debt. Not sure what you're getting at. Theory is bunk, and historians have all the answers? Is that it? No. I am just saying sometimes a lot of theorizing seems to go on with assumptions like rational expectations when we can get some answers from historians who have been looking at case studies that have actually happened in the real world. We know from the beginning to the end what happened. I am not saying everyone does it, but a lot of abstraction seems to go on so we can get a mathematical model. Another thing that happens is that people run huge amounts of data through a computer programmes with very little historical context (I accuse Rogoff and Reinhart of doing this to some extent although I do not say that their work was totally useless). Want to know what happens when central banks purchase large amounts of government debt? Does it lead to recovery or inflation? What about credit policy (and the monetising of private securities). Yep, we have examples of that too. Did it end Western Civilisation as we know it through hyper-inflation? In one case it was almost accompanied by something like that, but the credit policy or the massive issuance of government debt was not the cause. What I would like to see when I open the JME is lots of factual and contextual detail, and an abstraction only when really needed. I don't think any serious economist would argue that we should ignore data, and that necessitates digging into the historical record. But you can't make sense of the historical record without theory to organize how you think about the data. Tom Sargent is a good example of an economist who has respect for the theory (including rational expectations, which you seem to think is some goofy kind of fooling about) and for history. I am relieved to hear that Stephen, perhaps what I have seen is not properly representative. I have, however, read some Sargent, and I have to confess, he does not impress. In many ways this is an extreme case of the bad practice I am talking about. One thing he looked at was the stabilisation of inflation in the interwar period. In this study he basically sets out the case for rational expectations theory (which is not the correct way you do history). His basic conclusion was that inflation was stabilised in Germany, Czechoslovakia, Austria and Poland once the money supply was tied to commodity money (ie reduce the guaranteed reserve component in your reserve for money supply) because it established "policy credibility". To an historian that is likely to be absolutely ridiculous. The cause of inflation all historians would agree (with their own independent investigations) was a result of the disfunction these economies faced brought upon by events during WWI. They had either lost the War or came out of them as failed states. Their currency did not have "currency". A barter system had taken over. Inflation was stabilised once law and order and institutional control and authority had been restabilished. To the extent that the restoration of the Gold Standard helped was only in so far as being icing on the cake. The critical condition was the re-establishment of government authority. Power is a big variable missing in neo-classical analysis and is why you need to consult other schools of thought sometimes, including Marxian analysis. Otherwise you get people who think that inflation or currency collapse is only caused by monetary factors or never caused by monetary factors. Ask a Classicist. He will tell you that during the Roman Empire the currency was continually debased (literally the silver content reduced in the coins). It did not matter as long as Ceasar's head was on the coin and he had the political authority to say it was worth what he said it was. The Gold Standard could work until 1914 as long as Britain had the authority to ensure its enforcement. In the interwar period that was no longer the case. We had to wait until 1945 and a decisive war to sort out new power arrangements for a new monetary system based around the US dollar. Such an oversight by Sargent is tolerable, as huge as it is. But the unforgivable thing was starting with his Model, using data which does not give you a big enough picture (ie money supply, currency and price data) and then going out to prove it. You look at the historical evidence first (which must be wide in scope and include as much primary material as possible), then you make your conclusions - which may include a model. But the model must not come first because it will dictate the analysis and therefore the conclusion. 3/ Check if the data is consistent with your theory. If yes, great! Do some further tests. If no, go back to step 1 and try again. I have a lot of time for using historical episodes to better understand economics. But the reverse methodology you describe sounds a lot like data mining. Sure, you can identify correlations in the data. But how do you test whether those correlations are spurious or telling us something systematic about the world? Good Lord Steve, why give a crackpot like Waldmann free advertising? There is enough bad crap out there without making it easier for dumb people to find it. People will have no trouble finding bad crap. The hope is that, in sometimes addressing bad crap, some people are convinced who otherwise would not be. Two things. First the phrase "Keynesian multiplier effects" really needs an agreed definition. Economists including Fama, Cochrane and Lucas assert that the multiplier must be zero. But as soon as data is consulted the Keynesian claim becomes that it is greater than one. 1>0. Second, I have the impression that your comment on how failure to FRED is inexcusable is ironic. Can you give an argument for excusing failure to FRED ? This means that G works through Investment too. Consumption has not such a very special role in 1960s era Keynesianism. This is for non residential fixed investment (also subtracted from GDP). 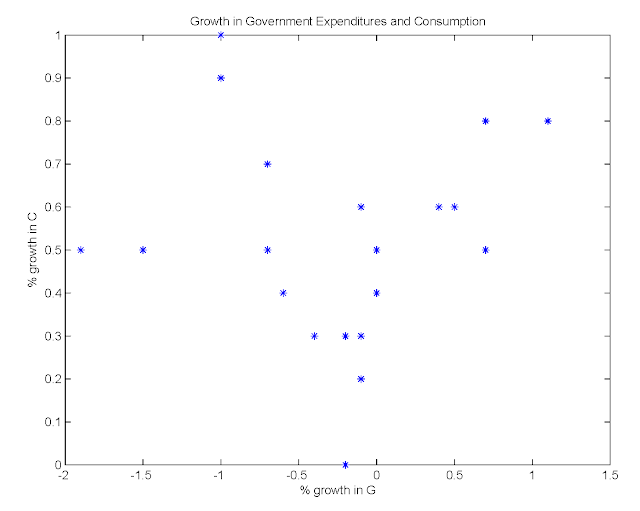 If one were to pretend that this absurd regression is the estimate of the true causal effect of anything which affects GDP on investment, then one gets a multiplier greater than one without any effect on consumption (there is also an effect on consumption in the data, but as of say 1965 consumption no longer had a very special role in explaining why the multiplier is greater than one. "Economists including Fama, Cochrane and Lucas assert that the multiplier must be zero. But as soon as data is consulted the Keynesian claim becomes that it is greater than one. 1>0." Fama is, to my knowledge, a finance guy, and has not done any research in modern macro. Cochrane has said some stuff in blogs, and the WSJ about multipliers. With regard to Lucas, I think you're referring to some stuff he said in public forums. Why don't you go to the published research on the effects of government spending? There is plenty of it, and it doesn't come down to: Keynesians > 1, others = 0. "Can you give an argument for excusing failure to FRED ?" Can you give me an argument for excusing failure to read? This means that G works through Investment too. Consumption has not such a very special role in 1960s era Keynesianism." Yes, I agree that "paleo-Keynesian" is a good label for this sort of thinking. I hope you understand that there are actual theories that explain why investment and output are positively correlated. This post is spectacularly uninformed. Good job, Robert, you have really managed to bring incoherence to a new level. Then we would set C - A = C + I = PE. (4) Y = PE + G.
These are all trivial equations no one should dispute. (5) PE = c*PE + c*G.
(7) Y = c* Y + G.
There is nothing spectacular here but we could call it a base case. A base case that we can test and expand with more sectors. I think we should notice that when the G term is defined as government expenses, then any effects of borrowing to pay these expenses has been included in both the Y and G terms. That is an inherent contamination of the terms by the creation of money (at worse) or investment borrowing (at best). So far as I can determine, this contamination can not be teased out of the Y term. 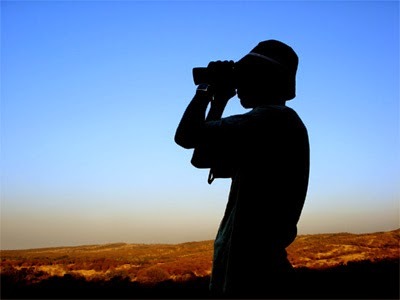 I think the best analysis that can be done is to trace any new money or borrowed money by the anticipated spending sequence. The easiest analysis is to observe that the new money is first spent by government and then assume that new money is immediately re-spent in patterns identical to patterns of old money. Thanks for the thoughtful post. Happy New Year! You are in desperate need of a principles of economics class. Preferably one I don't teach.